Find the best ways to work with Max. 4 Easy Steps To Building The Business Of Your Dreams. 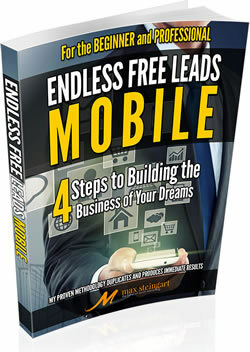 The simple program ANYONE can use to get the HIGHEST QUALITY free leads and quickly turn them into customers or team members. You’ll learn how the top earners in your business create a constant flow of ‘Cream of the Crop’ prospects who want to talk to you and rejection proof your recruiting. This is the easiest way to build your business in less than an hour a day that produces fast results and can be immediately duplicated by everyone on your team. It includes 6 separate training components that guide you through each part of the process. Stop chasing people! Inside this revolutionary eBook, you’ll discover 4 simple but powerful strategies you can IMMEDIATELY use that will cause people to pursue you. You’ll learn exactly what to say to separate your best new prospective customers and distributors from the time wasters. You’ll be provided with step-by-step, word for word, screen by screen instructions on what to do and say so you get off to a FAST START that can have you closing sales within hours. You’ll learn the secrets to effective posting and other forms of engagement that will fill your sales funnel with eager prospects who are ready to buy from you. Once they join you, they can immediately duplicate the process. You’re not going to believe how fast you can connect with perfect prospects and close the sale. You’ll be thrilled with the ease and simplicity of using this information to making sales on Facebook and LinkedIn. 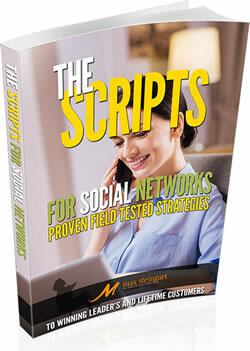 You’ll close more sales in less time with this jam packed document filled with scripts, strategies, tactics and transcripts that remove the guess work about online relationship building and selling. When you know what to say to a prospect in any profession that will have them enrolling in your business on a daily basis your confidence will soar whether you’re talking to someone on a social network, face to face or on the phone. With this information at your fingertips you’re on your way to becoming an unstoppable social network closer and top recruiter. Maximize your Facebook and LinkedIn presence to attract your target audience, gain online attention and expand your network with this comprehensive, step-by-step training that will set you up for social networking success. Learn the hidden tech-tricks to enhance your profile, improve it’s visibility, establish yourself as an expert in your niche business and pique more curiosity. 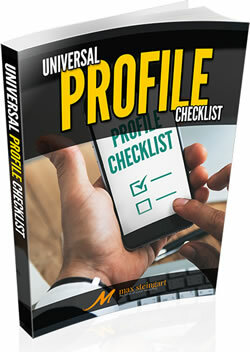 This profile check list provides you with examples of how to fill in every section of your profile to make you irresistible to everyone that sees it. You’ll be able to attract high quality prospects and start out your relationship with instant credibility. 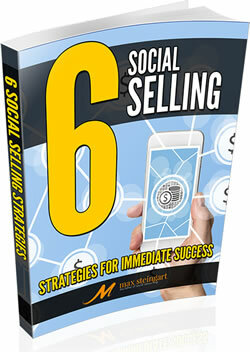 It contains unique exposure strategies, clever status updates and tips to dominate your market while leveraging your time. CONNECT: Master the Top Earner’s daily time management formula and work smarter to springboard your recruiting process to the next level with incredible momentum. Learn how to operate like a champion; search, find and source new contacts, and take daily, income-earning steps to transform your business and gain freedom, empowerment, and control of your life. CLOSE: Embrace abundance and make more money! This confidence-building sourcebook will provide the transcripts, tools, and ongoing reinforcement to raise your closing game. Make struggle, hesitation, and self-doubt a thing of the past by learning these safeguarded and trusted Top Earner techniques to troubleshoot and close deals in less time. DUPLICATE: These 6 strategies MAXimize your ripple-effectiveness with simple methods to drive next-level cold and warm market success. Dive into the endless supply of free social media leads the smart way and keep the momentum going. Have fun creating recurring online conversations you want to have, and on your terms. 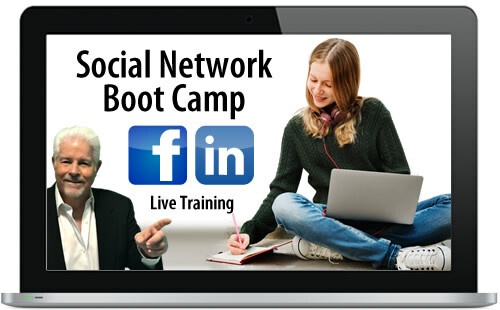 In the first hour of Boot Camp, I'll personally arm you with my revolutionary 4 STEP prospecting and recruiting social network formula for Facebook and LinkedIn that will have you making sales everyday from a pool of super high quality leads. Make a ton of sales during Boot Camp and enroll new team members with ease... starting immediately after the first session. I'll show you how easy it is to attract or locate perfect prospects for your business to recruit the CREAM of the CROP in less than a hour a day and eliminate rejection from the entire process. 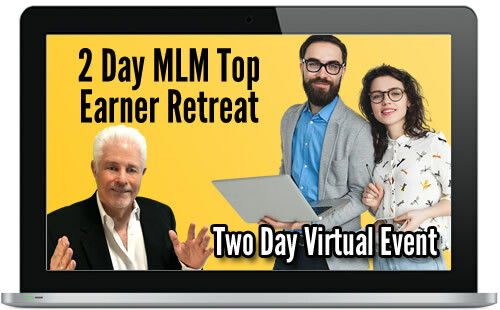 This invitation-only online master class is for serious MLM entrepreneurs who are committed to rising to the top of their company fast and want to master what the Top Earners know but never talk about. This 2-day advanced online workshop takes Boot Camp training to the next level with an in-depth approach that will kick-start your way to making 6-figures in your network marketing business. This is the step by step guide to starting a network marketing business using social networks like Facebook and LinkedIn. This proven process of achieving rapid growth in record time removes the guesswork from starting a network marketing business. 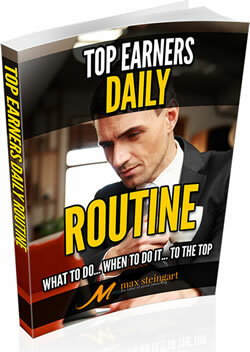 Follow the exact methods used by thousands of top earners. It lays the foundation to support future growth and massive duplication. 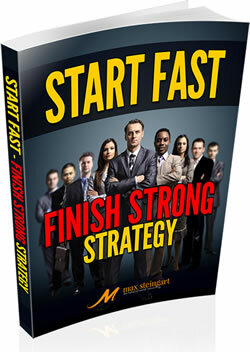 It provides crucial strategies for starting a network marketing business correctly. You’ll cut your learning curve in half; save time, money and energy; and avoid the common start-up mistakes that usually result in failure. 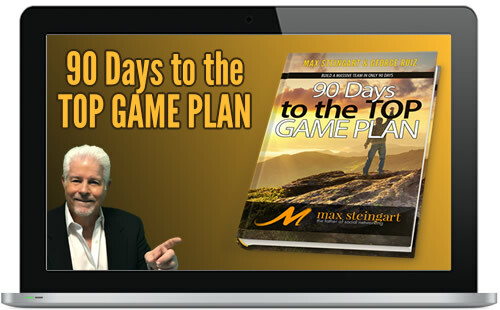 This simple executable 90 Day Game Plan leads you straight to the top. Use it to get your own business off the ground and then distribute it to each of your new recruits to watch your downline catch fire with enthusiasm. 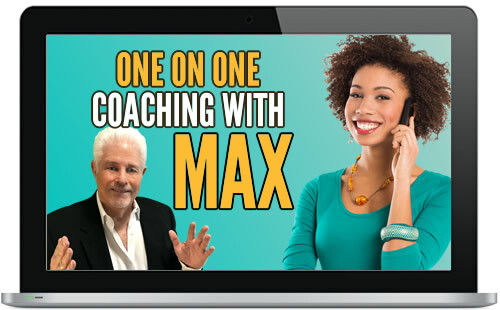 I have found that working one-on-one with my clients is the most powerful way to achieve results faster. It can be a high-value and liberating experience for you to work directly with me as your experienced and trusted mentor to identify and address the specific prospecting, recruiting and marketing challenges holding you back.